Today, there is a common perception that we are growing dumber as technology grows smarter. If you happened to catch the movie Idiocracy, you probably either laughed or cried the whole way through. Email has taken over personal communication so much these days that kids barely know how to speak to adults or pick up the phone for a normal conversation. Yes, we are all aware that there is plenty wrong with this picture, but is it really as bad as they say? It wasn’t long ago that the most common form of casual, long-distance communication was the hand-written letter, or “snail-mail,” as we call it today. It took decades after the telephone gained widespread use that long-distance calls became easy and affordable. Pen pals of days past may have persisted if it weren’t for the rise of the Internet. Today, most of us only use postal services for shipping physical packages, sending a birthday card here and there and maybe even paying bills, which is on its way to being universally replaced by credit card and online bill pay processing. Clearly, the way we use mail has changed considerably over the past few hundred years, and these same global changes in communication have also affected the way we write. In some ways, we have taken a step back in time in our modern world. Writing once again plays a major role in our constantly connected daily activities. What was once a laborious process of carefully shaping the strokes of letters is now as easy as tapping some buttons and hitting “send.” It used to be common to save cherished love letters as personalized tokens of affection. The more modern forms of communication are however perceived by many as cheap and disposable. What are you supposed to do… print, fold, and stash your special messages away in your “love box”? It is a fact that we have lost a major sense of physical human interaction these days, and the future of technology is making it look like this trend might continue to grow. BUT, kids today are writing, and possibly even reading, more now than ever. Social media, blogs, message boards, wikis, chat rooms, online newspapers, books, magazines and everything in between – these are all channels with a staggering amount of content. The quality of that content might sometimes be questionable, but the fact that the good stuff is abundant is not. In addition to that, what other day and age would we have had access to communicate with the best and brightest in our fields? Today we can just shoot them an email or join a teleconference to hear them speak live from another country. The digital age turns weeks, or months, into an instant. It fully opens the world of connectivity. It’s a fact that we all experience a considerable amount of information-overload these days. But at SeeMeDesign, we are on the other side of the argument from the movie Idiocracy. People are growing smarter side-by-side with technology, but we might summarize it as interactively-dumber-but-intellectually smarter, as in human interactively dumber, that is… But way-way smarter. One thing we certainly cannot argue about these days is that kids are surely learning to read and write. Come to terms with the fact that we know we will never see it again with the understanding and certainty that tomorrow, we will likely see something as good or better. Today we are knee deep in the Internet age, and there is A LOT of interesting information out there. That link to your favorite new light fixture has already been lost in your sea of bookmarks. But have no fear – someone has to come in to save the day and solve the problem. Pinterest is finally THE social networking site that allows us to compile images of thoughts, ideas and links from all over the place, into one place – It’s a photographic filing system. It is THE tool to help organize everything from products to recipes, art, thoughts, quotes, fashion and pretty much anything else you can imagine … in picture format. These images can come from any website out there, or even from your own camera. And as usual when it comes to social networking sites, your friends (and non-friends) can follow you and get a glimpse of the things you love. From a legal perspective, Pinterest has charted into unique territory. When it comes to copyright laws, usage rights and photography licensing, it gets interesting. If you’re not in the design, art or photography world, you might not realize this … But, since when has it ever been OK to take someone else’s photography, art or work and post it to your own page, possibly even as your own? Well, now it’s looking like it’s pretty much OK whether the “rule” list suggests it or not. Legislation these days is rapidly changing with the evolution of the Internet and new technology. It is obvious that Pinterest will be opening an array of new doors for change. As far as SeeMeDesign goes, we were a little reluctant to join yet another social networking site. But what do they say … “reluctancy killed the cat”… ? So, there you go. Go ahead and find us. Follow us. We have to admit, there is some merit to this concept. It is a tad-bit cool. When was the last time a design really popped out at you? Even though we all love a good design, the printing process plays just as much of a role in a great piece of work. The printing press brought literacy to the masses in the wake of its invention over 500 years ago. The old school printing method used a technique known as letterpress to physically stamp, or emboss, the surface where ink was applied. 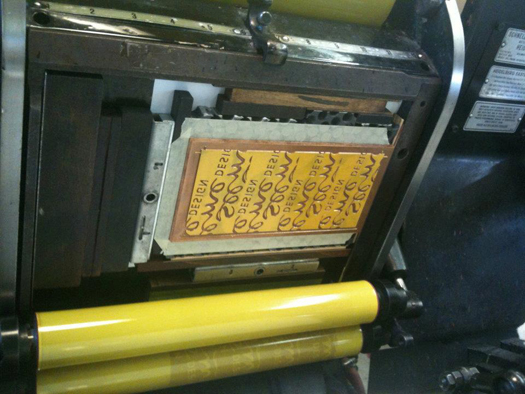 There have been all sorts of advancements in print technologies since then, but the art of letterpress is still alive. Today letterpress is becoming more popular and appreciated than ever. The prominent physical impression left behind by letterpress is a hallmark of its sophistication and craft. Although some of the newer technologies are faster, more efficient and more appropriate for certain projects, letterpress still stands to be the most sustainable, non-toxic and high quality printing method out there. More importantly from a business perspective, there’s no question that it makes a huge impact. Recently, several prominent design and technology commentators have questioned whether looking to the past has been stifling our generation’s progress in moving forward. An article in Vanity Fair’s January issue focuses on the harmful impacts of this trend, and an op-ed in the New York Times explores the pitfalls of nostalgia. It is true that through our leaps in technology, there have been great successes. But there have also been plenty of failures. Those failures create a good explanation for what appears to be trending backwards. One major key to growth and success is looking to the past to better develop our future – to help us recognize our mistakes and improve upon them. This concept explains the changes we see in the world today. People today have developed a greater appreciation for sustainability, community, healthier and more pure living and a larger desire for the craftsmanship achieved by the human touch. Printing has come a long way over the past 500 years. The new letterpress technology is now powered by electricity rather than muscle strength. The plates are carved by machinery rather than by hand. At SeeMeDesign, we believe this process makes such an impression that we chose to work with Henry & Co. to produce our new letterpress business cards. Even if this period in time is ever compared to The Dark Ages, it’s important that we all realize that it is necessary to look back in order to move forward. And oftentimes, the quality of the tried and true is superior to the latest trend. 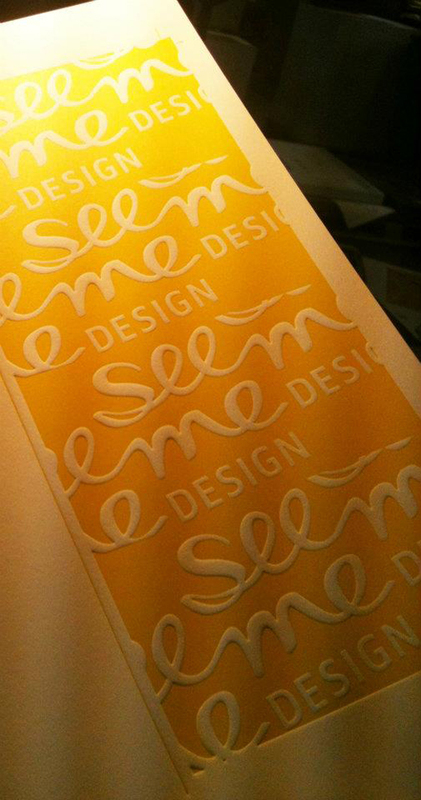 Look at that beauty… it’s the beginning of the SeeMeDesign business cards. The letterpress and plate that made the imprint shown above. Make the world green with envy! Now is your chance to win the 2012 HGTV Green Home at Serenbe. What is that, you might wonder? Every year, HGTV demonstrates the best and most efficient way to build homes that are eco-friendly, sustainable and designed for healthy living. But best of all, this green home will be given away to one lucky winner along with a car and some extra cash. If you haven’t heard about Serenbe, it is one of the country’s first planned sustainable communities, located about 30 minutes south of the airport. The community is rich with artists, local and fresh-farmed foods and unique shops and restaurants featuring local finds. 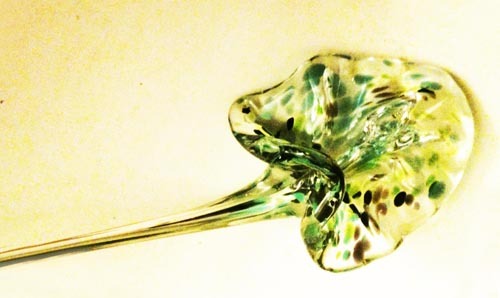 It’s a perfect fit for the HGTV Green Home. This year’s home has all sorts of features designed to promote green living, from furniture made out of recycled objects, to energy-saving appliances, to a rooftop with six solar panels. The house itself will teach you a lesson or two about sustainable green construction geared towards an environmentally friendly, cost-effective and healthy way of living. 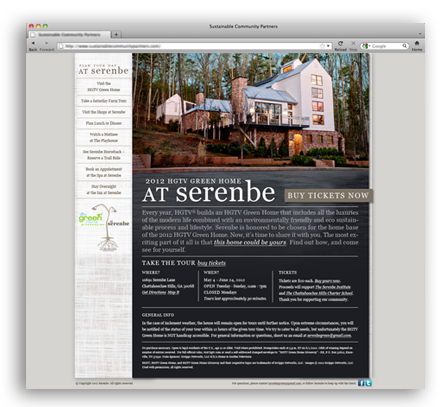 SeeMeDesign is pleased to have been chosen as the designer of the Serenbe’s HGTV Green Home website. Take a look. And while you’re at it, go ahead and use the site to book your tour. We did!